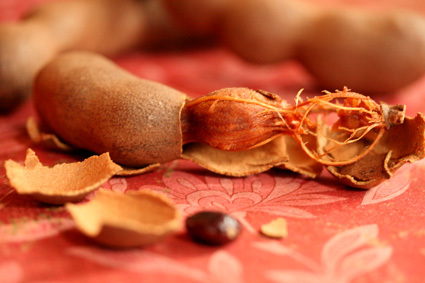 Loved by lemurs and Indian and Thai food fans, tamarind is a tropical fruit that is now available in the US. Its sweet and sour pulp, rich in vitamin C and high in protein, has a tanginess that reminds me of barbecue sauce. Native to India, it has been used as an ancient Ayurvedic cure for gastric and digestion problems, and can often be found in the form of a refreshing drink or savory chutneys served along fish and vegetable dishes. My neighbor Susan shared these tamarind pods with me last week. I loved eating the dried fruit directly from the pod and tried making my own tamarind paste that turned out to be really messy! Forget spending time fussing with the paste, because there are plenty of delicious, inexpensive tamarind products that you can order online. Toss the paste with cooked shrimp along with scallions, fresh cilantro, and lime. Tamarind also pairs wonderfully with honey, french ginger, and minced garlic. I call cinnamon, “America’s favorite spice”. Not only can you find it in millions of recipes and products, but I have never met anyone who doesn’t like cinnamon. Turmeric is considered a miracle spice by yogis and Ayurvedic experts, and now is being studied by modern scientists for it’s potential to heal.